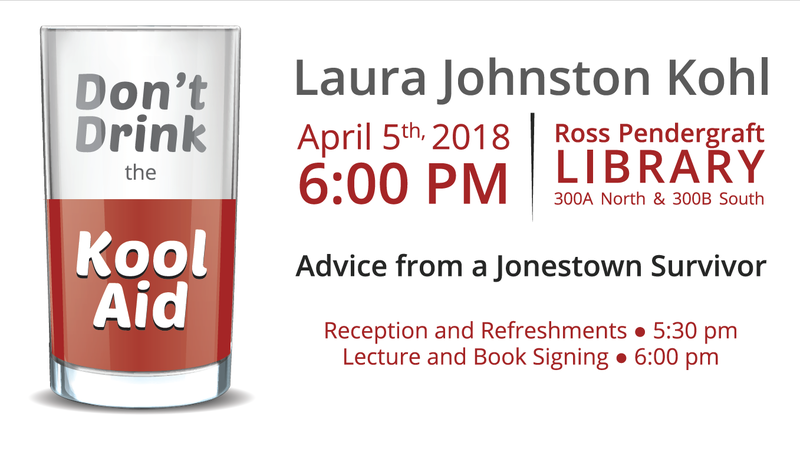 This Thursday, April 5th, join us for a very special presentation from a survivor of the Jonestown massacre, Laura Johnston. Her lecture, “Don’t Drink the Kool Aid: Advice from a Jonestown Survivor” will take place in RPL 300. A reception will be held at 5:30, with the talk scheduled to begin at 6:00 P.M. She will also sign copies of her book, Jonestown Survivor: An Insider’s Look, following the presentation. Admission is free and open to the public. The event is hosted by the ATU Department of Behavioral Sciences, the ATU Department of History and Political Science, and the ATU College of Arts and Humanities. Kohl was one of 87 members of the Peoples Temple who survived the Jonestown massacre in Guyana on Nov. 18, 1978. A total of 918 individuals perished in what was the single largest loss of American civilian life by a deliberate act until Sept. 11, 2001. Now a bilingual middle school teacher in California, Kohl’s speaking engagements focus on such topics as surviving tragedy, survivors’ guilt, sociology, political science, psychology and the red flags associated with cult dynamics. For more information about Kohl’s appearance at Arkansas Tech, contact Dr. Joshua Lockyer, associate professor of anthropology, at jlockyer@atu.edu.